Literary reaction to the year 2000 was muted, as far as I can recall. Gunter Grass, however, decided, that, if he could not commemorate the millennium, he could at least acknowledge the previous century. In 1999 he published a book with just such a title, My Century, a collection of one hundred short pieces, typically two to three pages, each focusing on one year, beginning in 1900 and ending in the present. The two elderly gentlemen are Erich Maria Remarque and Ernst Junger, German writers particularly associated with the First World War. Remarque’s All Quiet on the Western Front has long been regarded as the German equivalent of Wilfred Owen’s poetry, exemplifying the pity and suffering of war; Junger’s Storm of Steel, conversely, has often been seen to glorify the war. Chapters 1914 through to 1918 tell the story of their meeting, as if Grass is seeking to represent the full complexity of the German view of the war rather than give us the usual set-pieces. 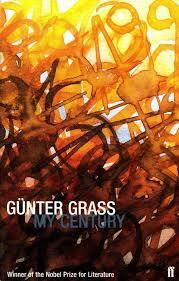 Grass uses a similar approach to the years 1939-45 when he focuses on the reminiscences of a war reporter. Grass also includes occasional autobiographical chapters describing his own life during that particular year, though as a public figure in Germany this goes some way to capturing the feeling of the times as well. The book obviously has a German focus – no bad thing considering how central Germany has been to the history of Europe, and to a lesser extent the world, during the 20th century – but global events are not ignored. 1982, for example, revolves around the Falklands War, and 1991 consists of a discussion of the Gulf War, and the way it was reported. I found My Century to be a fascinating collection (perhaps collage is the best description) of continual surprises, sometimes revealing the unknown, at others looking at the well-known from a new angle. You are currently browsing the archives for the Gunter Grass category.